Egypt III lived up to the hype, it was challenging, exciting and narrow. David had been raving about Egypt III since his trip a year ago and was eager to share the experience with Eric and me. (Click here for the previous Egypt III descent.) He had previously gone down Egypt II and up III. This time we were going down III. We awoke Monday to a morning enveloped in fog and mist. After successfully negotiating an extremely muddy road, we arrived at the trail head and began hiking down the upper part of the drainage that is Egypt III. Walking to the edge of the rim we were greeted with a magnificent view of the canyon and the surrounding area. As we took in the view the last of the fog lifted out of the slot and the sun returned. Egypt III is the narrowest canyon I have ever been in. Many sections of the canyon required us to walk sideways while carrying our packs to the side. We encountered some water and a block of ice and a snow drift in the canyon bottom. The last section of Egypt III was new for all of us. After the one and only rappel we encountered a lot more water. If the entire canyon had as much water as the lower section did, we would have been forced to turn around. This bottom section of the canyon was as narrow as the previous sections with the added intensity of being forced to swim sideways through the icy slot. The canyon was so narrow you could not use your arms to tread water and we were forced to use the canyons walls to prop ourselves and keep from sinking. It was beautiful to see the back lit steam coming from our bodies as we willed our way through the tight frigid passage. It was a great relief when we rounded the corner and saw the slot open back up into the real world. A slick rock hike back to the car and just like that our trip was over. Dinner at Subway, a search for an Escalante magnet (for Eric’s collection which he did not find) and we were back on the road. We made one final detour to check out Bryce Canyon. We rolled into one of the scenic overlooks just as the sun was setting. Mike in the fog in the morning. The fog lifts out of Egypt 3. Mike wades through water and past snow. Mike clambers out of a keeper. Laura naps on the drive out. Mike at an overlook at Bryce Canyon National Park. In a half sleepless state two thoughts went through my mind, tomorrow is going to be the peak day of the trip when we would attempt a descent of the much anticipated Neon Canyon and second, what is that pitter patter sound on the tent?. Waking up with just the faintest light in the sky I unzipped the tent to see the world outside covered in an inch of snow. Everybody woke and we all agreed because of the weather that a descent of Neon Canyon was out of the question. We made a hot breakfast and a fire with no real plans for the day as more snow fell from the sky. Before not too long the snow stopped and we began going through the extra beta we brought along to find a Plan B and decided on a Class A (dry canyon in normal conditions) technical canyon called Drill Hole Canyon in Kelsey’s guidebook. By the time we began the descent of Drill Hole Canyon it was nearly noon and temperatures had not reached above 40 degrees. Several down climbs including an intimidating but not too difficult 30- foot chimney brought us to a nice section of narrow canyon. 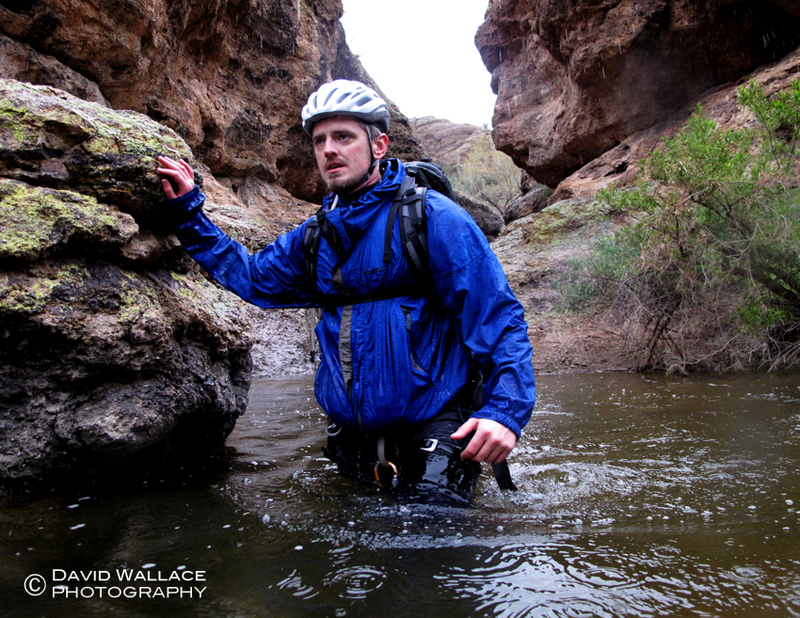 The wet winter had filled this Class A canyon with water forcing us to swim across several painfully cold pools. A few rappels later the canyon opened up for a while before reaching its confluence with Harris Wash. We made a fire at the confluence to warm up before venturing up Harris Wash to explore Zebra Slot, a narrow canyon with zebra-like stripes in the sandstone walls. Chest high water filled the bottom of the slot in sections. Eric and I explored a short way up the slot as Mike and Laura peered in from the dry entrance. 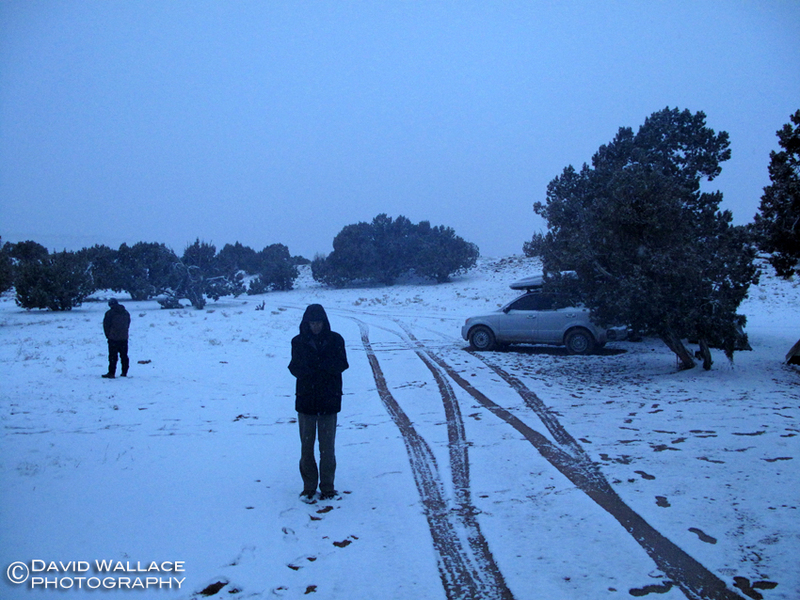 We hiked back to our car along the rim of Drill Hole Canyon with snow-covered mesas above. The sun set shortly before the end of the hike. In total darkness the drive back along the access road had a frightening moment as we began skidding on the mud towards a steep drop off along the side of the road. Eric handled the drive like a pro and got us safely back to the town of Escalante where enjoyed a restaurant dinner before heading back to our camp along Hole-in-the-Rock Road. We woke to an inch of fresh snow at our camp. With no real plans on what to do in the morning Eric collects fire wood. Eric stems down a 30- foot chimney in Drill Hole Canyon. It was intimidating but not that difficult. David swims across an extremely cold pool of water in Drill Hole Canyon. Mike and Eric share in a conversation on the rim above Drill Hole Canyon during the exit. Mike, Laura and Eric take in the sunset on the exit. Across the surreal, slick rock world we went to the edge of Coyote Gulch. We made our way down the “Crack-in-the-Rock”, a narrow crevice behind a sandstone flake that allows access to the sand dunes, which in turn access to the canyon bottom of Coyote Gulch. On the descent we spotted the massive Stevens Arch, a span believed to measure 220 feet. Once we hit the waters of Coyote Gulch. Mike, Eric and David made for a short side trip and headed down Coyote to reach its confluence with the Escalante River as Laura napped creek side with nothing but the sound of wind and water. After returning we all headed up the canyon nearly a 1,000 feet deep, encountering wonder after wonder including waterfalls, quicksand, natural springs, arches and a natural bridge spanning over Coyote Gulch. Though the canyon bottom was filled with trees and vegetation, Spring had not really hit this environment with only the faintest signs of buds on the ends of the trees. When we spotted the fourth natural arch of the day, Jacob Hamblin Arch, we reached our exit out of the canyon, a steep Class 5 ascent to the world above. From the rim we could see dark and ominous clouds rolling in. We hurried across the slick rock and back to our vehicle as we now spotted rain in the distance. Having to set a new camp to put us closer to the canyons we would be attempting in the next several days in this vast wilderness, we broke down the Dance Hall Rock camp in record time to beat the weather. The precipitation began to fall on the drive to the new camp, but as we gained elevation it came down in the form of snow. We were given a brief reprieve to pitch our tents. As we sat around a campfire in our new home, how naive we were to think the weather had passed. The crew on the rim of Coyote Gulch. This is our album cover. 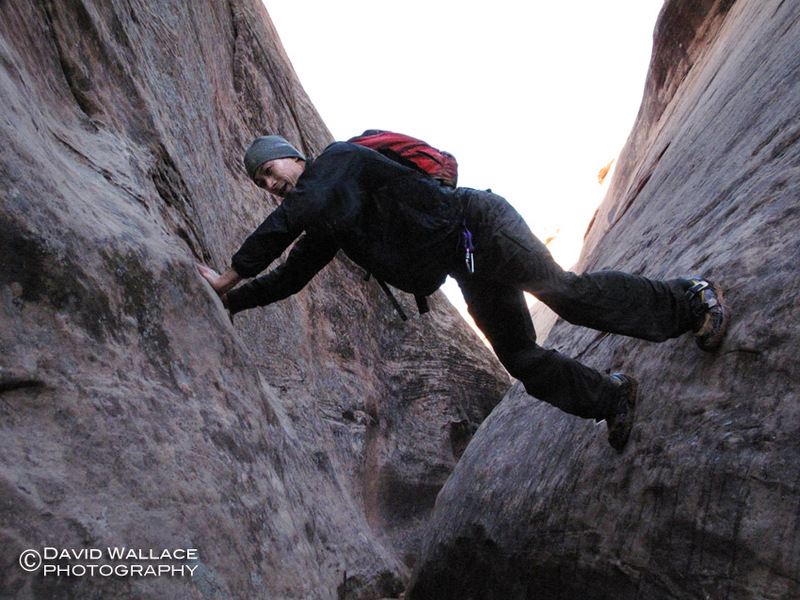 Eric descends “Crack-in-the-Rock” to access Coyote Gulch. 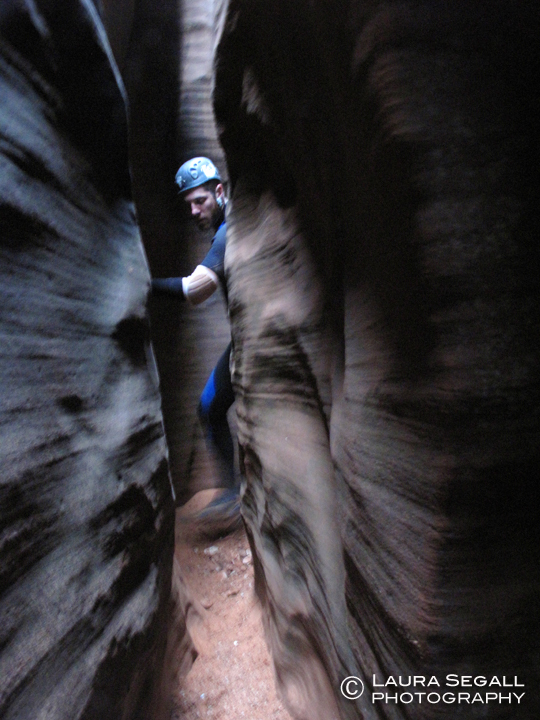 Mike silhouetted by glowing sandstone walls in Coyote Gulch. Eric takes in his surroundings in Coyote Gulch. Some sort of crazy oil-like slick on the surface of the water in Coyote Gulch. Maybe from algae or bacteria? Anyone have any ideas? Mike crosses a log over a waterfall in Coyote Gulch. Ominous skies over the rim of Coyote Gulch on the exit. We woke at sunrise, which revealed the beauty of our surroundings with the Straight Cliffs covered in snow and glowing in morning light. After driving down to the near end of Hole-in-the-Rock Road we began descending Davis Gulch. The drainage quickly formed a narrow slot with twisting walls, pools and down climbs. We tried stemming and bridging to avoid getting wet but eventually it just could not be avoided. There was just too much water. Based on Tom Jones’ beta we were expecting the narrows to last three hours. With full body wetsuits we were prepared for the long, cold and tricky descent through this section. The canyon did not disappoint in beauty and excitement, but just over one hour after leaving the car the canyon suddenly opened up and the floor was basking in sunlight. We were confused about the time. “Is it going to narrow up again and where were all those 20- foot down climbs?” we wondered. Once we hit the first set of moki steps (small hand and foot holds carved in the sandstone by the Anasazi and more recently Navajo people to gain access to the canyon bottoms) we knew we had in fact completed the narrows. After a discussion we concluded that the wet winter had made this section of canyon way easier than during previous descents by filling it with water and sediment. There was not a single down climb where a hand line seemed remotely necessary. This in turn allowed us to pass through the section so quickly. (Obviously, conditions in the canyon can change quickly and it would be prudent to be prepared for the canyon to return to more difficult conditions.) Nevertheless we were happy to be back in the sunshine. Mike and Eric took turns climbing the moki steps. The rest of the day was a leisurely stroll along a sandy wash at the bottom of this deep canyon. We passed cottonwood trees, beaver dams and a number of beautiful sandstone amphitheaters. We explored the massive Nemo Arch, aka Bement Arch. Much of the canyon bottom was chocked with tall grasses reaching well above our heads. As we exited the canyon we entered what seemed like a totally different world from that of below; a land of slick rock domes and depressions as far as the eye can see with the Straight Cliffs rising above this moon like landscape and further away Navajo Mountain looming blue and white, covered in snow. We came across a giant pool of rainwater and snow melt in the slick rock. Despite the brisk temperatures, for Eric and David it was too inviting not to pass up a cold and refreshing dip. Using Hole in the Rock Arch as a navigational point we made our way back to the car and then back to camp where we indulged in NY Strip over a mesquite fire with lots of beer and a little bit of whiskey. Laura peeks out of the tent on our first morning at our campsite at Dance Hall Rock. Mike stems to stay dry in Davis Gulch. Laura wades across a pool in Davis Gulch. Mike bridges to stay dry in Davis Gulch. Mike climbs the moki steps on the walls of Davis Gulch. Moki steps are small hand and foot holds carved in the sandstone by the Anasazi and more recently Navajo people to gain access to the canyon bottoms. 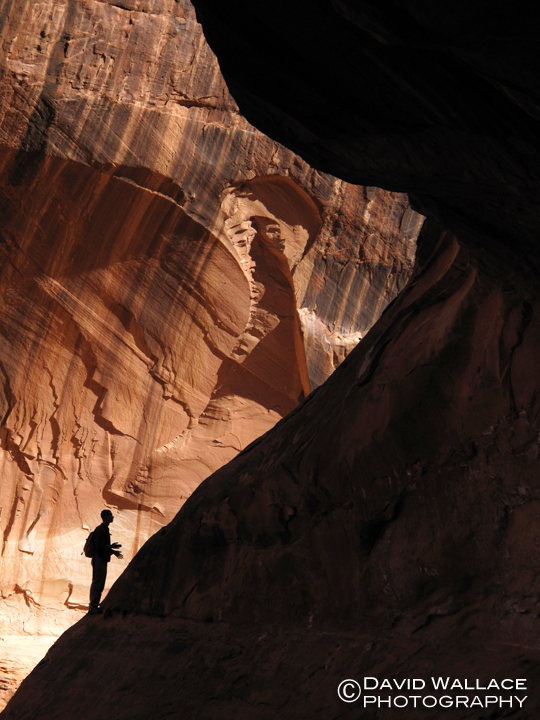 Mike is seen silhouetted in Nemo Arch, aka Bement Arch in Davis Gulch. Mike traipses through the high grasses of Davis Gulch. Mike climbs out of Davis Gulch. Eric and David are reflected in a giant pool of rainwater and recent snow melt in the slick rock above Davis Gulch with snow covered Navajo Mountain seen in the background. Eric bathes in a giant pool of rainwater and recent snow melt in the slick rock above Davis Gulch with snow covered Navajo Mountain seen in the background. The anticipation for this trip could be cut with a knife. The planning conversations were abundant ranging from “How are we going to fit everything in one vehicle?” to “Are the roads going to be accessible?” to “How cold and wet is it really going to be?” These discussions were consuming and weighed heavy. As David was checking weather websites with an unhealthy ferocity, Eric was retrofitting his roof rack and trunk. 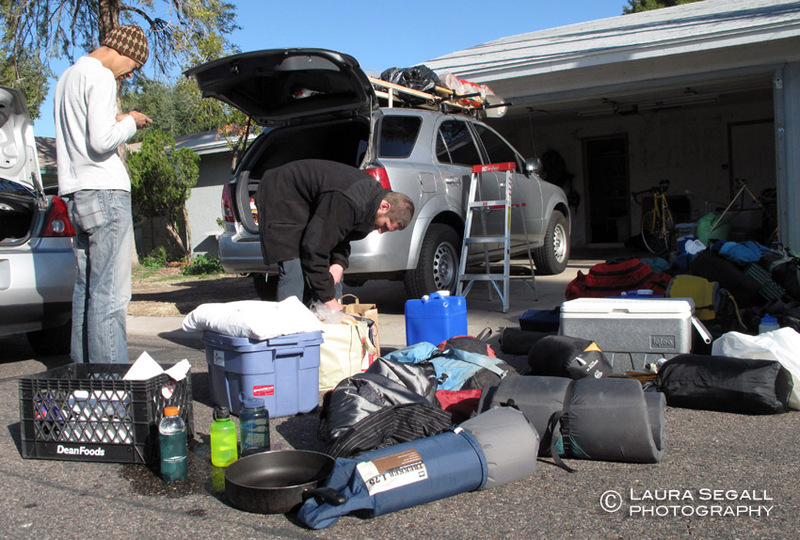 We needed to not only fit all of our gear, clothes and a stereo boom box, but also transport enough wood, water, food and beer for the 4 of us on a 4-night/ 4-day canyoneering adventure along the remote Hole-in-the-Rock Road in the Grand Staircase Escalante National Monument. Finally the day was here. We arrived at Eric’s house in North Phoenix early in the morning. After over an hour of puzzling together all of our gear into the vehicle and cinching down bundles of wood and bags of clothes on the roof we were headed north in great spirits. Somewhere along Highway 89 between Flagstaff and Page we looked out the window in horror as the wood began flying off the roof rack at over 70 mph. Thankfully the wood all harmlessly landed on the shoulder and we were able to quickly recover everything as cars and trucks whizzed by. After a quick stop at a BLM field office just across the Utah border to get some current road conditions, we decided against tempting fate on the shortcut on Cottonwood Canyon Road, a dirt road that cuts through the heart of the Grand Staircase Escalante National Monument. Volunteers at the field office told us we would most certainly get stuck in thick clay-like mud. It is frustrating when the road distance from Page to our camping destination along Hole-in-the-Rock Road is 230 miles, but as the crow flies it is no more than 70 miles. The trek requires literally traveling 270 degrees of a circle. As we got closer to the town of Escalante and marveled at how much snow there was, the road became an obstacle course of wild animals. Eric and David watched as the pick up driving in front of us plowed over a couple of wild turkeys. Just minutes later we had our own close call with a herd of deer testing the effectiveness of our vehicles brakes with our overloaded cargo. Finally making it to Hole-in-the-Rock Road as darkness slowly set in, we negotiated the muddy spots and camped near Dance Hall Rock, a large mound of Navajo sandstone that the Mormon pioneers who built the road in the late 19th century used as a campsite, natural musical amphitheater and dance hall. We made our first of many campfires on this moonless night. The brilliance of the twinkling stars was matched by the sparkle of the frost that began coating everything. It was really good to finally be here. It has been a crazy winter in the southwest. I imagine that people living in most places throughout the country that may be reading this are thinking someone from Phoenix has no business complaining about the winter. Ok, well maybe we have not endured months of continous sub-freezing temperatures and blizzards that paralyze a city with several feet of snow, but we have had one of the wettest winters on record. It has made getting out to the canyons difficult, at best. Luck would have it that many of these El Nino storms have been hitting our corner of the world on Sundays, which has been my one day off as I have been consistently working 6 days a week. The cabin fever has been intense; staring out windows while playing Scrabble and an unhealthy penchant for checking weather websites. This past Sunday was no different. Another storm brought heavy rains throughout Arizona. Instead of canceling our canyoneering plans yet again, we decided to adjust from descending a more involved all day canyon that we had never done before to descending the short, sweet and straightforward Apache Trail Canyon,that I have descended many times. (Click here to read about previous descents of Apache Trail.) After rappelling into the Narrows the rains intensified, but never enough to make a flash floods a concern for this canyon on this day. The trip was short and uneventful, other than the fact that it was Kyle’s first technical descent, hopefully the first of many. The normally brownish landscape was vibrantly green, thanks to all that rain. The quick getaway was just enough to cool that cabin fever before some much bigger trips that are just around the corner. Kyle drops in during his first technical canyon. Kyle wades through a pool under a light rain.